Anyone who has visited a film set in Oklahoma City in late summer probably has the same handful of takeaways: the real-life cowboys milling around, the picturesque mom and pop diners dotting Route 66, and the city’s breathtaking open skies that even a wide-angle lens can’t truly capture. It’s the kind of natural beauty that makes you hope they know what they’ve got there. To wit: The Oklahoma Film + Music Office is currently offering a cash rebate of 35-37 percent on qualified transactions, with a base increase of two percent for a minimum spend on music recorded in-state. The rebate program, which OF + MO Director Tava Sofsky says is “among the most competitive film incentives in the U.S.,” was recently given a 10-year extension until 2024. Sofsky also says that Oklahoma City is undergoing a renaissance and notes the city’s inclusion in a 2017 Forbes ranking of top 10 cities for entrepreneurs as well as nods in other rankings for lowest cost of living and lowest cost of doing business. More ear-to-the-ground evidence might be the city’s healthy smattering of noted film festivals, including the deadCENTER Film Festival, founded in 2001 to bring attention to local moviemakers and named for its location in the exact center of the U.S. There’s also the anticipated 2018 opening of Rodeo Cinema, in a 1924 building in the Stockyards neighborhood that was once a live music venue. The theater will be a sister cinema to Tulsa’s Circle Cinema, which shows arthouse fare and specialty programming. 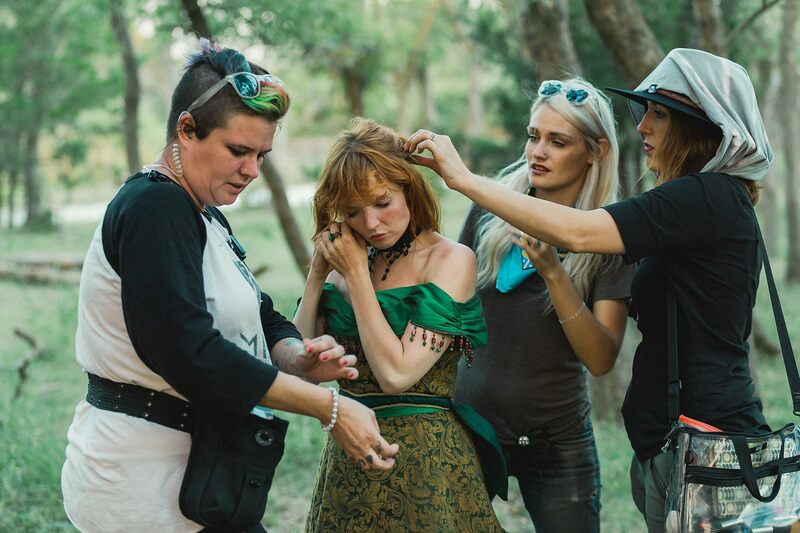 Crewmembers prep Stef Dawson (C) on the Oklahoma City set of Painted Woman. Photo by Priscilla Tran.